There are many reasons why you should make the switch to natural. Traditional laundry detergents are petroleum based and petroleum is a nonrenewable resource. Most also have chemical fragrances and phosphates that build up in bodies of water (streams, lakes, etc.) and starve fish of oxygen. They may also contain chemicals that have been linked to reproductive issues and cancer. Oh and those chemical fragrances may cause allergies, asthma, eczema and may even contain phthalates. We’ve discussed that yucky chemical before (see my posts about air fresheners and shower curtains). You will also need to nix the chlorine bleach. They release chloroform into our air which is a carcinogen. And when chlorine bleach is washed down our drains it can create organochlorines. This is another suspected carcinogen and is also toxic to the reproductive, neurological and immune systems. All that damage just for whiter whites? So what are your alternatives? For starters, switch to a natural, plant-based detergent. I also happen to prefer “free and clear” versions. Now that I am so used to unscented cleaners, I find that even the natural fragrances in these detergents can give me headaches. I once tried a lavender scented natural detergent from Costco. I only did one wash in it and then I returned it because it was just too strong for us. My twins were still nursing at the time and Josh disliked the smell so much they he refused to nurse on the days when I was wearing a shirt washed in it. My favorite detergent is Seventh Generation Free & Clear. Others to try: ECOS Free & Clear and Ecover Laundry Wash. If you really need bleach, choose one that is chlorine free. Try an oxygen based one which is better for the environment and easier on your clothes. Some bleaches to try: Ecover Non-Chlorine Bleach, Seventh Generation Chlorine Free Bleach, OxiClean Free and OXO Brite. Be sure to choose a natural fabric softener as well. All the companies mentioned above also have fabric softeners. Or you can try some homemade solutions like putting a cup of vinegar in with your wash, preferably during the rinse cycle. I promise that your clothes won’t smell like vinegar! Try to only wash in cold water though you may want to stick with warm water for your sheets. Only run your washing machine with a full load. Wash loads back to back that way when you use the dryer it is already heated up. 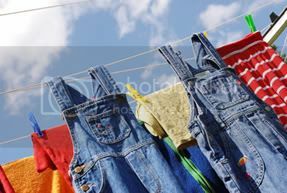 Take advantage of warm weather buy hanging your clothes outside to dry. If you are in the market for a new washer, choose a front loader. They use a fraction of the water and are more energy efficient. Excellent info. Thanks for posting! Great tips! I've actually been using magnets and Himalayan Soap buds to clean my clothes for the last 2 years. It took me about a year to fully transition to this and to "believe" that I could clean my clothes without laundry detergent. I use a natural bleach alternative from Nature Clean (a Canadian brand) when there are stains or a load needs some extra cleaning power. If I run out, I just throw some vinegar in the water. Keep sharing the great info!